Odometer Fraud may be the largest act of fraud committed against the American consumer today. Under the Department of Transportation, The National Highway Traffic Safety Administration has estimated that close to half a million vehicles are sold each year that involve some form of odometer fraud. The collective cost paid by the American consumer in inflated car prices for these vehicles is estimated over one billion dollars. Most Car buyers won’t be able to tell if a used car has had its odometer rolled back just by looking at it and if they ever do discover that they were scammed, most seller’s have discovered how to exploit various laws to making proving that they are guilty of fraud fairly difficult. If you suspect that you may own a vehicle that has had its odometer rolled back or spun, then you should give our office a call at 213-282-2000 as pursuing a case against a fraudulent seller is fact intensive and most often requires the knowledge and experience of a odometer fraud lawyer to bring these criminals to justice. Rolling back an odometer can be highly profitable as each mile that comes off a used car can usually generate the seller about 10 cents in profit. With most odometer roll-backs averaging 30,000-40,000 less miles, this quickly generates about $3,000-$4,000 in profit. Vehicles coming off of leases are not only having their mileage lowered by these resellers, but also by the people who leased these vehicles who who are trying to avoid paying the lease return mileage fee. Other owners will rollback their miles to commit warranty fraud, where the lowered mileage allows them to continue to have the factory pay for their repairs. In each case, not only will the new owner be stuck paying more for a vehicle than it is worth, but the owner will not be aware of when routine safety checks or scheduled services are due, making the vehicle increasingly dangerous to drive. Rolling back an odometer to make it appear that a vehicle has lower mileage than it actually traveled. Disconnecting an odometer or owning a vehicle with an odometer that is not working or that has been disconnected. Failing to disclose the actual mileage of a vehicle in writing at the time of transfer or sale. Failing to report that an odometer has rolled through all the digits and started over. Replacing an odometer without reporting the replacement. Improperly converting a Canadian vehicle’s kilometers to miles. Failing to accurately report the miles on a vehicle’s odometer or the condition of the odometer if it is either broken or has rolled over and started over is illegal. In fact, it is even against the law to own or drive a vehicle with a broken odometer under any circumstance other than taking that vehicle directly to a repair shop. While some dealers may physically roll back the mileage on a vehicle they are selling, others will simply misquote the mileage on the odometer statement and sales paperwork to qualify the vehicle for more profitable manufacturer and lender programs. Some lenders will lease a pre-owned car using a new car residual if the vehicle has less than 3,000 miles on it, and most manufacturers offer special interest rates or vehicle certification that includes an extended warranty protection which is based on the age of a vehicle and the miles that it has traveled. In fact, most extended warranties and service contracts become invalid when a vehicle has traveled 100,000 miles, so dealer odometer fraud can be committed against the buyer, manufacturer and a service contract company all in one fell swoop, allowing the dealership to pocket profit and commit odometer fraud against everyone involved. Physically rolling back the miles or "spinning" an odometer is relatively easy for someone who possesses the right tools. It may only take about 10 minutes to roll back the mileage on an analog odometer and where digital odometers where once thought to make changing the miles next to impossible, these days all someone needs to do is download the needed program off the internet, install it on a laptop and the digital odometer rollback can be performed in a flash. Dealerships and manufacturer's don't have a way to match the miles stored in a vehicle's computer with the vehicle's odometer miles, so the digital rollback can go completely undetected. 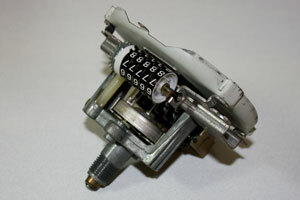 Inspect a Mechanical Analog Odometer’s Numbers – The numbers on an analog odometer physically spin and should be aligned straight with evenly spaced gaps between the digits. If any of the numbers are crooked, then the odometer may have been tampered with. On a General Motors (GM) vehicle you should also check to make sure that the space between the numbers is black; if the spaces are white or silver then the odometer has been tampered with. Also look for pencil marks on the numbers or the face of the numbers and for fingerprints, scuffs or scratches on the inside and edges of the glass or plastic protecting the instrument cover. Tap or hit the dash to see if the numbers move at all and look for missing screw or other pieces that may indicate that the dash was opened. Finally, test-drive the vehicle to make sure that the numbers on the odometer move correctly and that the numbers do not make a clicking noise as they turn. Inspect the Electronic Odometer Display – A digital odometer that displays anything other than a number, means that the odometer has been tampered with. Many automobile manufacturers will use a letter or the asterisk symbol (*) to indicate that digital odometer tampering may have occurred. If your odometer display anything other than numbers, you should look at the vehicle’s reference manual to see what the symbol or letter showing indicates. Sometimes when a digital odometer has been tampered with, the tripometer stops working. Check the tripometer on a test drive to make sure it is working before buying the vehicle. Check the Vehicle’s Tires – The tires on an average passenger car often last between 35,000 to 60,000 miles before they need to be changed. If there are fewer than 20,000 miles on the odometer, then the original tires should still be on the vehicle. While a vehicle with low mileage and new tires may not mean that the vehicle has had its odometer tampered with, you should be suspicious and find out why the tires were changed. Look for Signs of Interior Wear and Tear – The amount of wear and tear on a vehicle should be consistent with the amount of mileage that the vehicle has been driven. Heavily worn seats, floor mats, carpeting, brakes, gas and clutch pedals can all be good signs that something is amiss. A lower mileage vehicle that has had any or all of these items replaced could be equally suspicious as the seller may have only replaced these items to make the odometer rollback less obvious. Look For Maintenance Sticker’s and Receipts – You should search a vehicle for stickers that have mileage reminders for when a service was due. Oil-change stickers are often found on the inside of a windshield and may have been overlooked by whoever committed the odometer fraud. Less obvious places that you may find stickers with mileage documented include under the hood, on door frames, on side windows or even in the glove box. While looking for maintenance and reminder stickers, you should also keep an eye out for any piece of paper that might be a receipt. Service receipts, warranty cards and inspection tags might have been left in the vehicle and may have the vehicle’s mileage documented on the date they were printed. Look for these items in the glove box, between and under the seats, under floor mats and even in the trunk between the liner and a spare tire if one is present. Finding mileage that is greater than the odometer is a good sign that the car has been tampered with. Review the Vehicle’s Title and Registration – Checking a vehicle’s title and registration is not always fool proof. While you may find a mileage discrepancy in writing, you should pay careful attention to other factors that may hint to odometer fraud or even completely cover it up. Always ask to see the vehicle’s actual title, not a copy or a duplicate. Check the odometer against title and see if the mileage on the title is clear and easy to read or if it has conveniently been damaged in some way that makes it hard to read. If the title came from out of state, was sold several times within a period of a few months or is new, you should be very suspicious. Title washing is quite common, and many individuals who “rollback” or “clock” an odometer will exploit the weaknesses in state laws to wash a title and make catching them much more difficult, if not impossible. Review the Selling Dealer’s Records – State and federal laws require that dealerships keep extensive records on every vehicle that they buy and sell. A dealership should be able to show you the odometer statement from when the dealership acquired the vehicle as well as an inspection certificate that would include a date and the mileage of the vehicle at the time it was inspected. Some dealerships may also have access to the service records of newer vehicles. Reviewing the service history for the dates that warranty work was performed may not only reveal that an odometer has been tampered with, but it may show other safety problems and defects that the vehicle has exhibited. If you ask, you may also be able to speak with the previous owner about the mileage and condition of a vehicle when the sold it to the dealership. Have a Mechanic inspect the Vehicle – If you suspect that the odometer on a vehicle may have been changed, then you should have a trusted mechanic inspect the vehicle thoroughly for signs of wear and tear that indicate an odometer may have been tampered with. Have the mechanic check the shocks and springs to see if they have been replaced “prematurely” as well as reinspect all of the items listed above. The mechanic should also check the engine, emissions system, suspension and steering for abnormal amounts of wear. Finally, the mechanic should check the odometer itself to see if it has been rolled back or had its cover removed. While a good reconditioning job can make a higher mileage vehicle look younger, a good mechanic should be able to quickly recognize telltale signs of fraud that a buyer might never see. In every state, Odometer Fraud is illegal, and charges against those who commit the crime range from fines to imprisonment. When one act of odometer fraud is discovered, it is not unusual to discover an additional 10-15 other acts of fraud that have been committed. If you suspect that you are a victim of odometer fraud, where either your odometer was rolled back or the mileage was not properly disclosed, then give us a call at 213-282-2000 or fill out our FREE Vehicle Evaluation Form and one of our CA Odometer Fraud Attorneys will review your case to discuss what legal options are available to you.